Literature in America has been through a lot of changes, especially if we look at the literature from the 17th century. In fact, most writers don’t consider 17th century literature “American” because most of the writers were English, and most of their styles followed that of English writing (Brunjes). Poetry, specifically, changed a lot from the beginning of the colonies to the end of the Revolution. 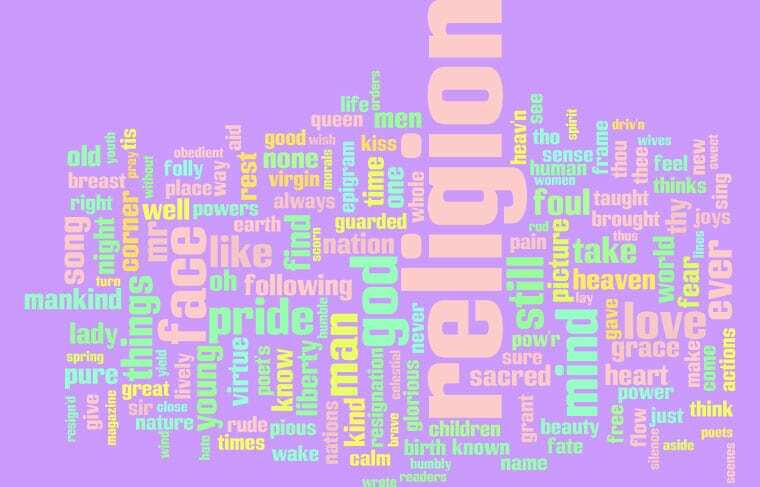 If you look at the word clouds above, you can see that religion is the largest and most common word used in the poetry I looked at. This stems from the fact that the colonies were originally started based off of a need for religious freedom from the Church of England. Many poems discuss events occurring in England, which makes it easy to identify the take of the person writing the poem. One poem in particular is very short, but it discusses the voting on the Quebec Bill in 1774 by seven bishops. The poem is titled “A Wish” and states that once seven bishops vote on the bill, then religion will return back to power. It is just one of many poems revolving around foreign affairs, but they all relate close to the writer’s heart. A lot of the poetry consists of propaganda, humor, politics and news, but all of them share the common theme that religion is key. Not all the religions were the same, keep in mind, but looking at the poems, its very clear to see that religion helped settlers and colonists feel connected somehow. Some poems bash on other religions, while others praise their own. Occasionally the word religion would be used not in the literal sense, but rather as a way of living. In those cases, the poems tended to have a humorous tone behind them. What is most interesting that I found amongst articles and descriptions of 18th and 17th century poetry is that modern writers and educators don’t see this poetry as good or even worthwhile (Poets.org). This era of literature is often seen as a dark time for writers in America (Brunjes), and most people wouldn’t be able to tell you about poets from before the mid-1800s. This is mostly because the poetry is focused solely on what was going on around the writers then and there (Britannica). This meant that some of the poems didn’t have a lot of purpose, but they give a great insight into what settlers may have felt like. The writing isn’t applicable to modern society, because we are not fighting a war for our own independence. Poetry and most writing in general in the 18th century that I found focused on the tensions between America and England and the war itself. Often poetry could be used as a way to provoke people into fighting for the cause. Looking at the change in tones from the 17th century to the 18th, you can see a growing nationalism amongst the poets. A lot of the poetry that I looked at placed importance on the will of God, which appears in the word clouds. Some of the poems show that the settlers believed God’s will for them was to create their own country. This was a common finding in the poetry selections; people saying that their actions and success in the colonies was due to God’s good will. These poems were especially difficult to understand, which is another reason why modern writers don’t consider them to be literary or important (Brunjes). Clearly, I don’t think this is true. The phrasing and terminology used in the poems aren’t exactly easy to decipher, as there wasn’t a common structure followed. Rhyme was very common, which made the poems feel more natural, but also meant that finding the actual meaning behind them took some work. But after looking hard enough through the different meanings of some words used more often than others, I started to see that those words were also some of the largest in the word clouds. Face is a good example, because they didn’t use it to refer to the physical face, but rather the way a person behaves. Other word’s context needed to be taken into consideration to find the underlying tone in the poems. Words like young and pure would be used almost as a back-handed compliment in some poems to say that someone was naïve. But, I digress, as the literary aspects of these poems – though very intriguing – are not the point. I feel it’s important to look back at these literary works, even if understanding their context and meaning isn’t exactly easy. These poems help us to understand what the common people of society before, during and after the American Revolution felt about what was happening around them. The fact that most of the poems published in newspapers at the time were submitted by local citizens meant that their view of what was happening was extremely opinionated but insightful. Looking deep into the meaning of some of these poems, it’s clear to see where a lot of modern ideas of religion and freedom come from. And the poems don’t stop there, they touch on all sorts of things that the people dealt with. There are poems about men who abuse alcohol and therefore lose their religion, poems about how to be a proper female virgin by keeping quiet and almost impossibly perfect; there are poems written about how a blind woman thought a man’s face was a baby’s bottom, and all of these poems can come together to help us see what the people back then saw. It’s easy to see that the Revolution wasn’t a time of joy for the settlers, and so poetry was seen as many things, including a form of entertainment to help them through the times. Poems were used to express opinions and open a public forum about the idea. Many people used pen names to keep anonymity, which probably helped to keep things civil between people who knew each other in real life, but held very different opinions on the matter. All of these things can easily be related back to modern uses for poetry. It astounds me that most people don’t know of this literature just because it’s not considered “literary” when in reality they’re just as literary as any of the poetry people write today. Yes, the themes focused more on the nation, religion and freedom than today’s poetry, but is it really that different? Poetry is used to express emotions and it’s often associated with the portrayal of pain in a more artistic manner. Poetry in the 18th century was also used to convey pain, just a different sort of pain. A pain felt by the fear of God or the fear of death while fighting for their country. The subject matter may be different, but the drive behind the writing isn’t. Poetry is such a beautiful thing, and it can encompass so many different aspects of the human nature. Not considering a large portion of historical literature as actual writing means that we, as a whole, cannot then fully understand the human nature of our ancestors. The whole reason we look at past literature isn’t just so that we can appreciate the meter or rhyme schemes – though obviously that is a major aspect of it – it is so we can better understand what was going on with the writer and why they wrote what they did. This is why we read poetry, and this is why it’s so helpful to read poetry from the revolutionary era, so we can understand the minds of the people who helped this country become what it is today. “The American Struggle for Identity in the 18th Century Newspaper Verse”. Bridgewater State College. Ann Brunjes, June 1998. “Poems of the American Revolution”. Poets.org. July 02, 2008.